Wide view of the Security Council during its meeting on Cooperation between the United Nations and Regional Organizations. Citing more than 20 years of collaboration between the United Nations and the Organisation of Islamic Cooperation (OIC), a senior UN political official today urged greater efforts by the two entities to draw on each other’s strengths and devise joint strategies to prevent and resolve conflicts. “The magnitude and complexity of [global and regional] challenges are simply too big for any country or organization to tackle alone,” Assistant Secretary-General for Political Affairs Miroslav Jenca told the UN Security Council during an open debate, which explored best ways for the two organizations to enhance their strategic partnership in preventing and countering extremist ideology. “To be successful in preventing and resolving conflicts, we need to join forces with the Organization of Islamic Cooperation, to devise joint strategies and draw on our comparative advantages,” he added. The UN has been working closely with the OIC for more than 20 years in promoting a culture of peace, tolerance and understanding, he said, noting that in the last years, the UN, in particular through the Department of Political Affairs, has stepped up its cooperation with the regional organization and has engaged with it to promote a deeper political dialogue. The best approach to these challenges is to deepen strategic dialogue to forge common approaches to emerging crises, he said, explaining that their cooperation is reinforced through direct contacts between the secretariats of the two organizations and between the specialized agencies and bodies of the UN system and the OIC. The UN has taken a number of steps to institutionalize its relationship with the OIC by helping strengthen its capacity through mediation and electoral assistance, and by holding desk-to-desk talks with the OIC on areas of mutual concern, such as peace and security, he added. Mr. Jenca went on to highlight how the two entities worked together closely in addressing challenges in several countries and regions. The UN and the OIC share common objectives in promoting and facilitating the Middle East peace process and the question of Palestine. On Yemen, the UN Office for the Coordination of Humanitarian Affairs (OCHA), the UK Department for International Development and the OIC co-chaired a high-level event on the humanitarian situation in the country. The UN appreciates the OIC’s support for a peace process in Afghanistan, whose realization is crucial for long-term growth and stability of the country. In Sudan, the partnership between the UN and the OIC remains an indispensable part of the collective effort of the international community to bring peace, security and development to that country. In Darfur, the core of that partnership has been the support of the OIC for the signing and the implementation of the Doha Document for Peace in Darfur. In Somalia, the UN and the OIC maintain a critical partnership in state-building, as well as in promoting comprehensive peace and security. In Mali, the OIC was a member of the international mediation team during the 2014-15 inter-Malian dialogue and remains a committed member of the Agreement Monitoring Committee to this day. During the electoral process in the Central African Republic (CAR) at the end of 2015, the OIC played an instrumental role in defusing tensions between rival political parties in the country. In agreement with Chad, the OIC successfully called on the Front Populaire pour la Renaissance de la Centrafrique (FPRC) to cease hostilities in the CAR and allow for the elections to take place in areas that were under its influence. “Let us use this valuable Security Council meeting to reaffirm and deepen our common commitment to promoting peace, respect for human rights and offer of better opportunity for all the peoples of these regions and the world,” he concluded. 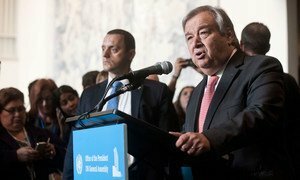 On 13 October 2016, the UN General Assembly appointed, by acclamation, the former Foreign Minister of Portugal, António Guterres, as the next United Nations Secretary-General, to succeed Ban Ki-moon when he steps down on 31 December.